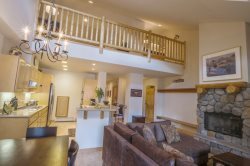 Great for groups of eight or a large family, this condo offers ample space for entertaining guests and making the most of the family vacation. The loft sleeps two on one queen bed and features a private bath. The bedroom is furnished with two queen beds and includes another private bathroom. The living area has a queen sofa bed as well as a full kitchen, a third guest bathroom, and a gas fireplace. You will check in at The Lodge as guests of the owner and leave no credit card or pay any fees to them. You will be given key cards for entering Mountain Club #320/322. If checking in after hours, an envelope with your name will be in the wooden late check-in box located in the front entrance of the Lodge. Parking is located underneath building in space #320.